This post is dedicated to my husband, Blake. I want him to know how proud I am of him. I am constantly in awe of his persistence and talents. He recently landed the job of his dreams all because he had the guts to contact one of the biggest entrepreneurs in Utah. He has been on cloud nine all week and it has been great to see him so happy. For those of you who know Blake, you know that when he gets giddy he likes to jump around like a ballerina on crack. It's pretty entertaining. I love you Blake and I can't wait to see what the future has in store for us! P.S. I selected this image because Blake's first meeting with Paul Allen was held at Jamba Juice. Hm. 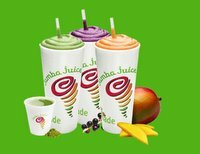 Who knew that having meetings at Jamba Juice would end up so successfully? CONGRATS BLAKE!!! WE ARE ALL REALLY PROUD OF YOU!!! Blake is doing great things already... even though I only know him from arm's length at this point. I'll have to cough up the dough for a Jamba and shake his hand in-person.